A woman canoeing the pristine waters of Tuckamore Lake in Main Brook, Newfoundland as the sun begins to sink away. Late afternoon is a beautiful time to go canoeing on Tuckamore Lake in Main Brook, Newfoundland when the sun is beginning to set and the calm waters reflect the clouds and landscape. 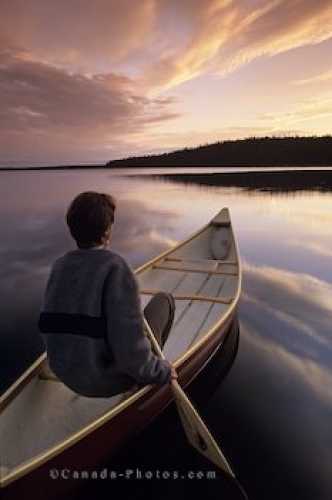 The peaceful sounds of the wilderness and the ripples from your oar in the water of Tuckamore Lake are the only noises that surround you while canoeing. Picture of a woman canoeing on Tuckamore Lake in Main Brook, Newfoundland at sunset.